The magician draws attention to an opaque tube standing on the table, of which three balls (red, yellow and green) are printed on its front side. The magician lifts the tube. 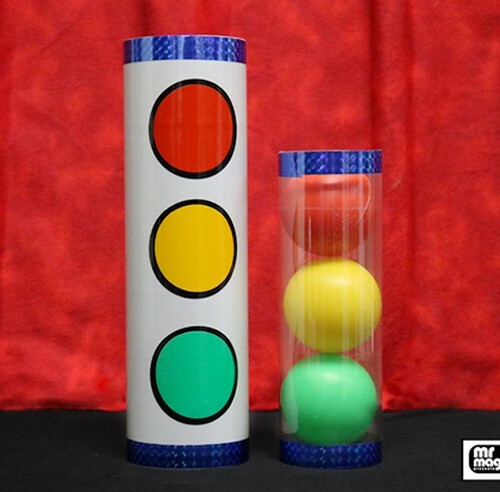 It is seen that there was another small and narrow transparent tube inside this tube, containing three balls (red, yellow and green) one above another. He then removes the balls from the tube and covers the empty transparent tube with the empty opaque tube. He drops the three balls one after another into the nested tube, first the green ball, then the yellow ball and finally the red ball. When the opaque tube is lifted it is seen that the red ball is at the bottom inside the transparent tube, instead of being at top. The magician repeats the same once more, but the result is same, the red ball appears at the bottom. Finally the magician vanishes the red ball and drops the green and yellow balls into the nested tube. When the outer tube is lifted it is seen that the red ball has returned and has joined with the other two balls. As usual, it took the bottom position within the clear tube. The magician shows the opaque tube empty.